In the second week of November 1999, His Holiness the Pope John Paul-II was to declared before Asian Bishops Conference in Delhi that the third Millennium must see ‘Harvest of Faith’ in Asia. The Mammon must therefore come to India enlarged. There was much unrest and violent reaction, attacks on Christians in Orissa and Gujarat. Violence and acrimonious ‘debate’ needed to be converted into a nonviolent reasoned dialogue. This book was an outcome of it. “ Hindus must meet this challenge in ways befitting our culture of non-violence. It would require that we remove our moral, intellectual and spiritual lethargy. We earnestly wish to identify the end of second Christian millennium not with 2000 years of Jesus Christ’s death, but with 2000 years of Jesus Christ’s birth. 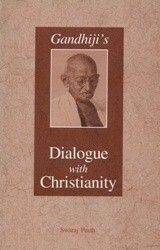 Gandhiji’s dialogue with Christianity is most comprehensive, insightful, thoroughly forthright and offcourse devoid of malice. Gandhiji was not silent about Missionary activities, as he was aware of spiritual and moral lethargy of Hindu society also. He called religious conversion ‘blasphemy’ and proselytisation the “deadliest poison that has ever sapped the very foundation of truth.” At the same time he called untouchability a sin, which, if it persists, Hinduism must perish. He told Christian Missionaries that the purpose behind their social service was impure till it was meant to be ‘social bait’. The strength behind their service, the British and American money, was likened by Gandhiji with Mammon – the idol of ill-gotten and evil money. To Dr. Mott, a foremost Christian theologian scholar and leader of world repute, Gandhiji said: “I am convinced that the American and British money which has been voted for Missionary Societies has done more harm than good. You cannot serve God and Mammon both. And my fear is that Mammon has been sent to serve India and God has remained behind, with the result that He will one day have His vengeance.”…. ….. Gandhiji asked Christian Missionaries to help Hindus become better Hindus by spreading flower-like fragrance of their unselfish service in the cause of God. He cited examples of such Missionary friends. We can also cite similar examples today. As examples, they have a great value as torch-bearers. And, torch bearers are in all religions…..